We manufacture 3- peice Aerosol Cans. We have latest state art of machinery. We deal in two diameters 52mm and 65mm. Length is as per customer requirement. We have inhouse printing facility. An aerosol can is mass produced by the impact extrusion process with minimum 99.5 % pure aluminium. Subsequent internal protective coating for compatibility with the contents and external decoration for aesthetic appeal and brand image is done to suit market and customers requirements on Advanced Manufacturing lines. - there is no leakage of the can since there is no joint/seam. Tinplate aerosol cans are becoming increasingly popular for packing common household products like insecticides, industrial and personal products because of their convenient design that makes them safe and easy to use. Known for their leak-proof features, these cans are widely used to pack a variety of liquids. 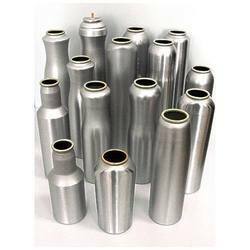 We are engaged in offering Aluminium Aerosol Can which are known for its effectual functioning among our valued clients. These are extensively used in pharmaceutical, perfume and allied industries. Moreover, these can be easily customized in accordance with client necessity and are delivered within stipulated time frame. 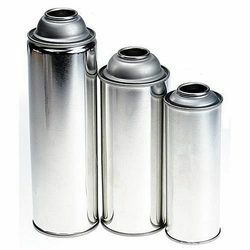 We are offering the best quality of Aerosol Tin Can to our customers.